I bought three nail polishes even though I really don't need any more, I must have almost 100 now! There were so many cute polishes I did well just choosing three really hehe. 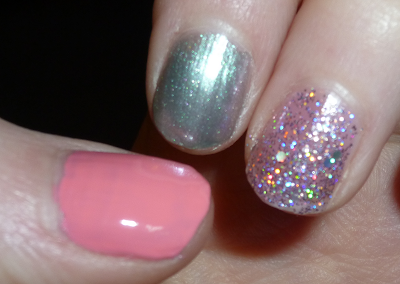 These are the first Topshop nail polishes I've tried and I'm really impressed. They are fast drying and are good quality. I picked up Flamingo Coral and Adrenalin in the regular Topshop makeup packaging plus Hypnotic from the Sisters of the New Moon Collection. This bottle was the most expensive at £6.50 but I really like the design on the lid and the polish itself is really unusual. It has a silver base to it with very tiny shimmery silver particles and it has tints of green or purple depending on the light. It's really pretty. Flamingo Coral was the cheapest polish at £5 and it's a lovely peachy coral colour - perfect for the spring/summer. Adrenalin is a gorgeous glitter polish containing small and large pieces of multi coloured glitter in a sheer pale pink base colour. This polish was £6. Next I chose a cream blush in the shade Flush - a lovely pinky coral colour. This was £6 which I think is a great price for a cream blush. The texture of this product is really nice as it's so silky and blends really easily. This product also has great colour payoff. I already own the Head Over Heels cream blush so thought I'd show a comparison as they are quite similar. As you can see Flush is more pinky coral but Head Over Heels is more on the orange end of coral. They are both beautiful shades though, I'm glad I have them both. Finally I chose a few lipsticks. I went for a lovely mid pink shade called Innocent and a coral shade called Ohh La La. These were £8 and are a velvet finish moisturising lipstick. 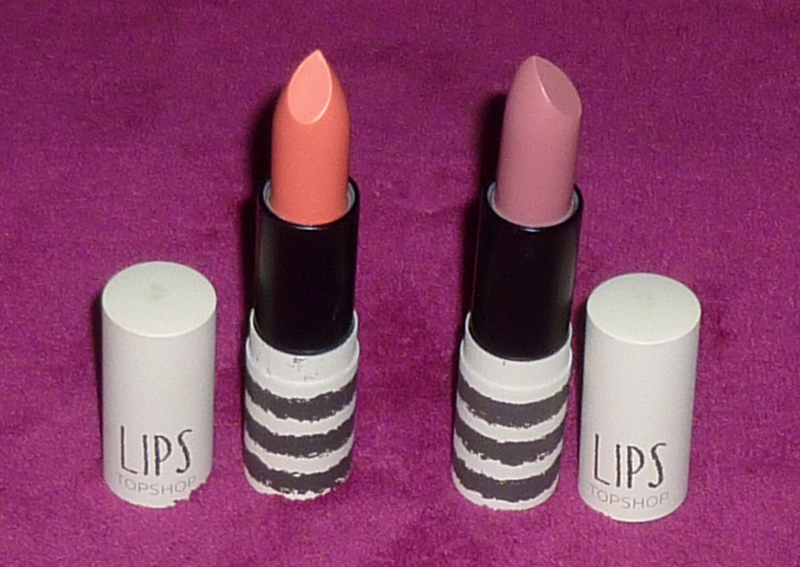 I really like these lipsticks as they are both great colours and they aren't drying on the lips. I'd say Innocent is more pigmented than Ohh La La but I like that as Ohh La La is a bright colour which I'm not used to wearing so it's good that you can apply it quite sheerly but build it up for a more intense colour as well. I think the nail polish in Flamingo Coral, Flush blush and Ohh La La lipstick will be a great combo for the summer so I'm looking forward to trying them all together. Have you tried Topshop makeup? What are your favourite items? I love this Haul!! That Adrenaline nail polish is beauty! and the Innocent lipstick is actually gorrrgeous!! I now have new items on my make-up wish list!! What else have I been buying this weekend?